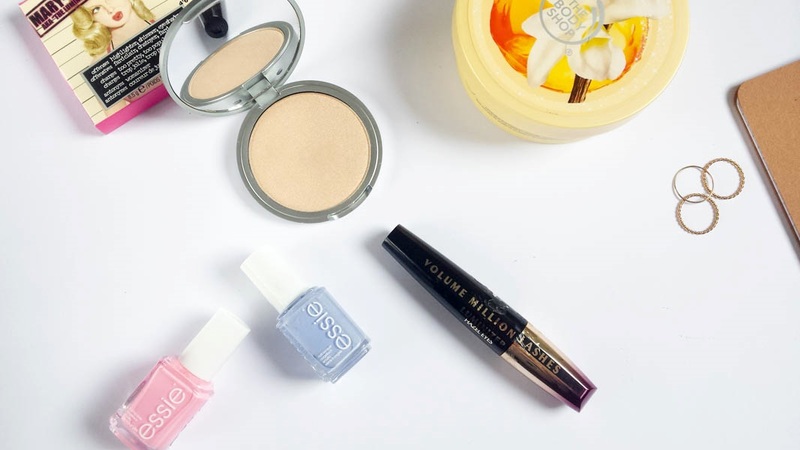 Discount beauty products, oh yes! Today's post is a little haul with some things I picked up recently during the sales. The Balm Mary Lou Manizer Highlighter, something that has been in my wishlist forever. Finally I bought it and I have to say that it is amazing! It's a light champagne/golden colour, very flattering that would look good on anyone. The texture is dreamy, so smooth and finely milled. This was 16 euro in a local store but it's 18 euro on feelunique right now. The Body Shop Vanilla Brulee Body Butter, this Christmas limited edition collection is half prize right now. The scent is amazing, creamy vanilla with a hint of caramel and biscuit, oh delicious! L'Oreal Volume Million Lashes Mascara Hazel Eyes. I saw this mascara for half of the prize and I was intrigued to try it. This is essentially black with a hint of purple and it supposed to enhance your eye colour making them pop. Essie Nail polishes: Need a vacation and Bikini so teeny. I looove Essie nail lacquers! and seeing Essie products at 50 % off is just happiness! Need a vacation is a lovely cool tone light pink and Bikini so teeny is a baby blue colour with some shimmer in it. Did you buy something during the sales? Any good bargains?